L'éolien au cœur de l'incontournable révolution énergétique is a serious work on wind energy for francophone readers. It is my kind of book, chocked full of drawings, charts, tables, and historical photographs and not a few equations to keep the most ardent engineer happy. L'éolien au cœur de l'incontournable révolution énergétique has been nominated for the prestigious French award 24ème Prix Roberval (2010). L'éolien is one of a number of significant works that have appeared recently in French, a sign that the francophone publishing industry considers wind energy a serious market. It's also a sign of the times that the English-speaking world is not the center of the renewable energy universe, that if one is to stay abreast of developments they must collect books not only in French, but German as well. Bernard Saulnier and Réal Reid are two of Canada's pioneers in wind energy. They have been leaders in their field among both francophone and Anglophone Canadians for decades. As Quebecois they have also formed a bridge with the early work at Hydro-Quebec, their employer, and the wider francophone, or French-speaking, world. This is the kind of book where color printing really makes a difference. Photographs, illustrations, side bars, and especially a child's drawing of wind turbines in a city skyline come alive in color. The book opens with a quote from Francis Bacon, "savoir c'est aussi pouvoir" (for also knowledge itself is power) and it conveys the loving attention that Saulnier and Reid have devoted to sharing their knowledge of wind energy with others. The introductory chapters are especially well done with pictures from Southern California to Copenhagen. There's a wonderful picture of the Tre Kroner historical fort in the foreground and both cooperatively-owned Lynetten and Middelgrunden wind farms. Yet the book's most serious contribution is debunking several pernicious myths about wind energy. Most importantly, Saulnier and Reid can write with authority about how wind energy can be successfully integrated into the grid at a reasonable cost. Early on in the book, Saulnier and Reid take on the question of wind's intermittency". Tellingly, they title the section "variability". As they explain, wind generation is not really "intermittent" but "variable" and isn't radically different from other power plants that they worked with at Hydro-Quebec, the provincial utility. Il-informed critics, say the authors, confuse variability with intermittency and, more seriously, with reliability. Saulnier and Reid take up this them throughout the book and illustrate how wind works, and how wind can and does work well in electric utility systems--not only in theory but in practice. There's a telling chart (Figure 3.1) on the variability of hydro-electricity and wind energy over a 30-year period in the Hydro-Quebec system. The chart illustrates that hydro-electricity is "variable" as well as wind, in fact more so. More significantly, wind energy can moderate or dampen the annual variability in hydro available. In the Hydro-Quebec system, say Saulnier and Reid, the grid works better with wind than without it. This is a theme that takes up much of the book. Elsewhere the authors of L'éolien explain that a utility system is designed to be "robust" to supply wide swings in demand without disruption. Managing wind they imply is no different than managing the variability of demand. Saulnier and Reid also take on the important question of wind's place in the landscape in an extensive sidebar that extends across seven pages. And unlike nearly all books on wind energy written by English speakers, L'éolien includes a side bar explaining why annual specific yield is important and how to use it. Most technical books on wind energy make the mistake of continually referring to capacity factor (plant factor or equivalent full-load hours in Europe), a measure of performance used in the utility industry. Because of the francophone connection, the Quebecois authors are comfortable using specific yield, a much more appropriate measure of wind energy performance than capacity factor and a measure used in France, Germany, and elsewhere on the continent. This review, unfortunately, only scratches the surface of L'éolien. The authors have spent their professional careers researching wind energy--and it shows. Where else, for example, can you find the dismantlement costs of wind, hydro, and nuclear compared on the same page. 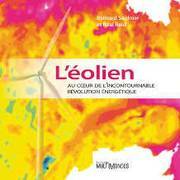 L'éolien is in French, "naturelment", but an essential addition to the library of any anglophone seriously interested in wind energy. L'éolien au cœur de l'incontournable révolution énergétique by Bernard Saulnier and Réal Reid, Éditions MultiMondes, 2009, 22.0 cm x 22.0 cm, 432 pages, ~400 g, paper, ISBN: 978-2-89544-145-8, $39.95 CAD.